This book is perfect for readers of early chapter books, eager to learn more about space travel. 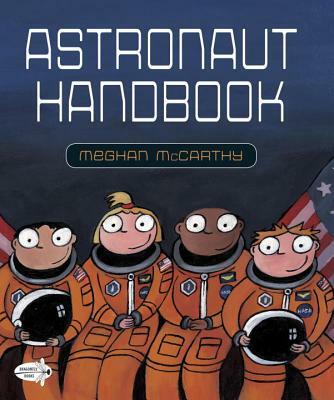 With the right amount of text, illustrations and, of course, humor, kids learn what it takes to become an astronaut. I mean really, who wouldn’t want to ride on the “vomit comet,” eat freeze-dried ice cream or fly to the stars? For ages 6-8. With an appealing text and funny, brightly colored illustrations, Meghan McCarthy transports aspiring space travelers to astronaut school in her young nonfiction picture book. Take a ride on the “Vomit Comet” and learn how it feels to be weightless. Try a bite of astronaut food, such as delicious freeze-dried ice cream. Have your measurements taken—100 of your hand alone—for your very own space suit. Get ready for liftoff! Meghan McCarthy is the author-illustrator of many nonfiction picture books, including Earmuffs for Everyone! ; The Adventures of Patty and the Big Red Bus; Strong Man; The Incredible Life of Balto; and Aliens Are Coming!. Learn more about Meghan and her books at Meghan-McCarthy.com.